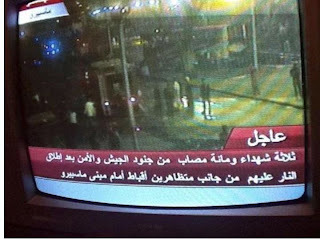 Egyptian Chronicles: #Black Sunday : When Egyptian TV calls for civil war !! On February 12th ,2011 the Egyptian National statement issued a statement regarding its misleading Pro-Mubarak regime coverage during the early days of regime claiming it was out of the TV and radio employees’ hands who were just doing what they were ordered to do. The statement promised Egyptian a new beginning after the revolution where the TV and radio union will the Egyptian people’s TV and radio. Of course this was only a broken promise from a state TV that can not follow anyone except whoever rules Egypt whether it is one man or bunch of men !! Yesterday the Egyptian TV hit a new low when it claimed that the Christian protesters were attacking the military police killing from them at least 3 conscript. It entered the world record for shameful lies when it urged the Egyptian civilian citizens to go and to protect as well as support the Egyptian army against those angry protesters !! The Egyptian National TV was calling for civil war , it was clearly calling for Muslims to clash with Christians when it was a clash between military police and Christian protesters. Dina Rasmy , the famous TV hostess on Ch.2 followed Youssef and declared that she was ashamed from working in that disgusting place according to what she posted in her Facebook account earlier today. 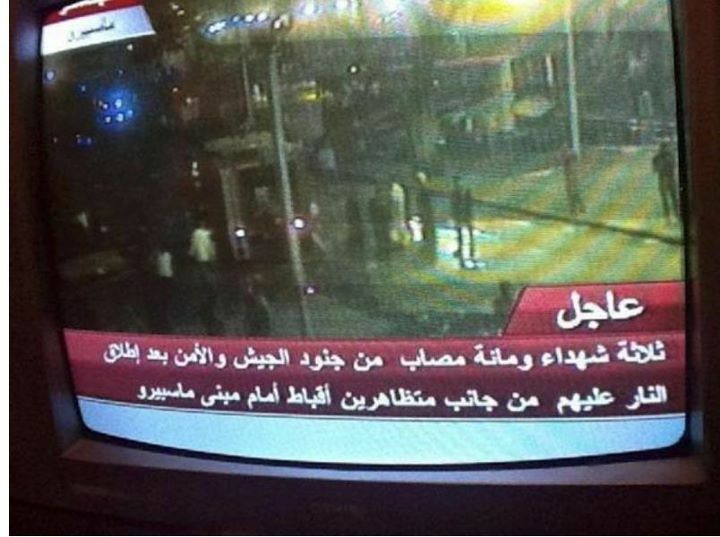 Rasmy added that the Egyptian national TV was calling for a civil war. Also TV hostess Riham Sallem criticized the shameful performance of Egyptian national TV yesterday in Op-ed published in Free Maspero website. Another anchorman Mohamed El Maghrabi has joined his co-workers who announced their refusal to the TV's coverage according to statement he published in his Facebook account. A Nile News channel Host defended the performance of Egyptian TV claiming that they were doing their job and it was the testimonies of the witnesses. I am not surprised since the SCAF statement started with condolences to the families of the martyrs the reaction of official media will be like that !! When I look to the coverage of the Egyptian TV especially News Sector yesterday , I found a huge resemblance between its coverage for the news and the coverage of El Wafd newspaper when Heikal was its editor in chief. Many political activists and politicians demanded his dismissal because of the coverage yesterday. Now to face the backlash and criticism as well as to follow his commanders who officially sent their condolences to the families of the martyrs , Osama Haikel announced earlier today an official day of mourning in he Egyptian TV. We do not if it is only 24 hours mourning but we know that the Cairo Opera House announced that it will suspend all the performances in its theatres for three days as official mourning. Strangely the football federation does not have any sort of decency and is going to have the Egypt’s Cup finale tomorrow between Zamalak Sporting club and Anabi Sporting Club regardless of all the people that were killed. Of course I am worried from any clashes between the security forces and Zamalak White knights Ultras. The ONTV channel's Newsreaders and TV hosts were indeed in mourning wearing all black. There is an online Facebook campaign by the way to boycott the National TV. There is currently online twitter campaign against National TV with hashtag #ShutdownPublicTV. Another thing no only 25TV Channel HQ that was stormed last night , American Al Hurra TV channel’s office and on air studio were stormed by military police in the same building searching for protesters. Here is the moment of the military police stormed Al Hurra studio while it was on air. "... they told me it was three Christians and one Muslim shot by the army and driven over using a humvee (yep, my tax dollars in action, btw, the U.S. gives two billion dollars a year as aid to the Egyptian military)." "I was there for about two hours, and then suddenly a mob came to the police saying “Christians where are you, Islam is here”. They were not stopped by anyone but cheered by army units that were parked by the CSF cordon."